The biography of this wonderful saint was written by St. Sophronios, the Patriarch of Jerusalem. 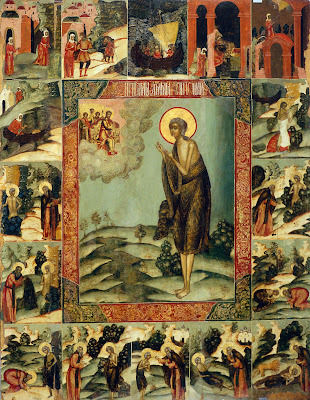 Once, during the Honorable Fast [Great Lent], a certain hieromonk, the Elder Zosimas, withdrew into the wilderness beyond the Jordan, a twenty-day trek. 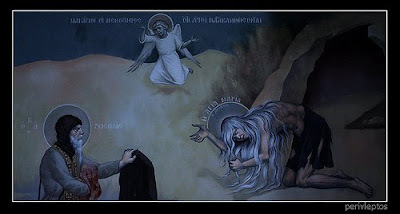 Suddenly, he caught sight of a human being with a withered and naked body whose hair was as white as snow and who began to flee from the sight of Zosimas. The elder ran for a long while until this person crouched down in a brook and cried out: "Abba Zosimas forgive me for the sake of the Lord. I cannot face you for I am a naked woman." Zosimas then tossed his outer garment to her which she wrapped around herself and then showed herself to him. The elder was frightened upon hearing his name spoken from the mouth of this woman he did not know. Following his prolonged insistence, the woman related her life story. She was born in Egypt and at the age of twelve began to live a life of debauchery in Alexandria where she spent seventeen years in this perverted way of life. Driven by the adulterous flame of the flesh, one day she boarded a boat which was sailing for Jerusalem. Arriving at the Holy City, she wanted to enter the church in order to venerate the Honorable Cross, but some invisible force restrained her and prevented her from entering the church. In great fear, she gazed upon the icon of the All-Holy Mother of God in the vestibule and prayed that she be allowed to enter the church to venerate the Honorable Cross, all the while confessing her sinfulness and uncleanness and promising that she would go wherever the All-Pure One would direct her. She was then permitted to enter the church. Having venerated the Cross she again entered the vestibule and, before the icon, gave thanks to the Mother of God. At that very moment she heard a voice saying: "If you cross over Jordan you will find real peace!" Immediately she purchased three loaves of bread and started out for the Jordan where she arrived that same evening. The next day she received Holy Communion in the Monastery of St. John and crossed over the Jordan river. She remained in the wilderness for forty-eight years in great torment, fear and struggle with passionate thoughts as though with wild beasts. She fed on vegetation. Afterward, when she stood for prayer, Zosimas saw her levitate in the air. She begged him to bring her Holy Communion the following year on the shore of the Jordan where she would then come to receive it. The following year, Zosimas arrived on the shore of the Jordan in the evening with Holy Communion. He wondered how this saint would cross the Jordan. At that moment, in the light of the moon, he saw her as she approached the river, made the sign of the cross over it and walked upon the water as though upon dry land. 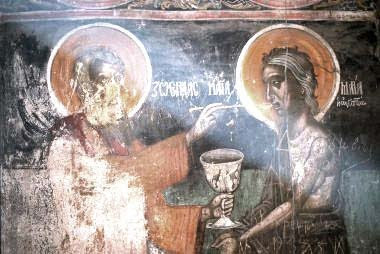 After Zosimas administered Holy Communion to her, she begged him to come the following year to the same brook where they had first met. Zosimas came and discovered her lifeless body on that spot. Above her head in the sand was written: "Abba Zosimas, bury the body of the humble Mary on this site; render dust to dust. I died on April 1, the same night of the saving-suffering of Christ, after having received Communion of the Divine Mysteries." From this inscription Zosimas first learned her name and the other and awesome miracle was that, she, on that same night the previous year, when she received Holy Communion, arrived at this brook which took him twenty days to travel. 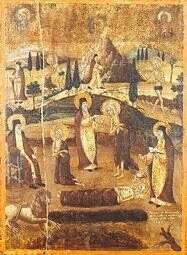 Thus, Zosimas buried the body of this wonderful saint, Mary the Egyptian. When he returned to the monastery Zosimas related the entire history of her life and the miracles which he had personally witnessed. Thus, the Lord knows how to glorify penitent sinners. St. Mary is also commemorated on the Fifth Sunday of the Honorable Fast (Fifth Sunday in Lent). The Church holds her up as an example to the faithful during these fast days as an incentive for repentance. She died about the year 530 A.D.
By the toils of thy struggles, O God-inspired one, thou didst hallow the harshness of the desert. Wherefore, we glorify thy memory, as we honour thee with hymns, O Mary, glory of the righteous.